I hope you had a good week. Ours has been stressful since my last post. If you were in the path of Hurricane Florence, my prayers are with you. For those who haven’t kept up with the aftermath, the state of North Carolina has been flooded almost across the state, but the coastal towns have taken serious damage. Even the major interstate highways of I95 and I40 have been flooded and impassable. To update you on our family members affected, my daughter and son-in-law in Charleston, SC were spared any storm damage and only inconvenienced by emergency measures at the hospital where my daughter works and evacuation processes. Whew! My son evacuated from Wrightsville Beach and if you have seen what happened there and to Wilmington, you know I am relieved. The hurricane directly hit that area and the flooding has been tremendous. For several days it was impossible to even reach the area other than by air. Relief supplies were air dropped to them. Unless he can work with the cleanup and relief efforts through the fire department, A. is probably going to be without a job now. He had hoped to work through October in ocean rescue, but the tourist influx has pretty much ended with Florence. He is also waiting to hear if and when his EMT certification class will continue. As often happens in everyone’s life at times, he is in the frustrating limbo land. Here in the hills we just got lots of rain with some river flooding nearby and had to stay put for a few days because the gas stations here ran out of gas. Otherwise, I got some time with my son. There are some perks during hurricane season! He helped me take some preventive steps to protect my bees in case the wind got up, thus the goofy picture of us looking like aliens. I did finish this little project. 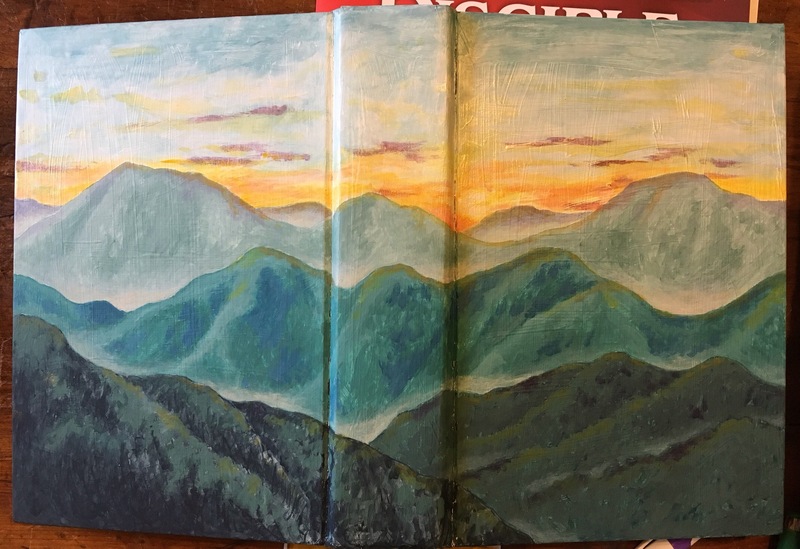 I painted my bible. We are taking a bible study while Miss L. is at Sunday youth on Sunday evenings and my bible was looking sad and beat up. So, I painted it. It’s a well known fact in my family that anything is fair game for my paint brush and they take care not to stand still too long in case I start eyeballing them as a new project. Otherwise, my week included having to buy a new stove as our old one was dying a slow death. We had no oven and one eye was no longer working, one was one its way out. We cook virtually every meal so a purchase had to be made. The hurricane even caused problems with that. Every stove I wanted was out of stock and the stores didn’t know when they could get more in because of the flooding. I finally found a display model and got a small discount, loaded it on my son’s truck (ours wasn’t working…another major expense this week) and got it set up. Now we just have to figure out all the bells and whistles. Today includes the wedding of one of my favorite young couples, so I am off to do the daily chores and get ready to celebrate with them.